Let’s have an overview of the test. IELTS, the International English Language Testing System, is designed to assess the language ability of candidates who want to study or work where English is the language of Communication. This is a standardized test that is designed to measure your language skills on all fronts. In fact, your IELTS score is the measure of your language proficiency. Universities and immigration departments use this score to decide whether they should grant your request for admission or emigration. When can I take IELTS? IELTS is offered up to four times a month in more than 125 countries. Tests are usually on Saturdays or Thursdays. You can book your test date basing on the availability of seats. Of course, you should also decide how well prepared you are for the test. This is actually vital consideration for deciding on the test date. What is the test format? There are two modules to choose from – Academic and General Training. The General Training module is for wishing to migrate to an English-speaking country (Australia, Canada, New Zealand or UK) and for those wishing to study or train at below degree level. What is the difference between Academic Module and General Training module? Both modules cover all four language skills – listening, reading, writing and speaking. Everyone takes the same Listening and Speaking tests. 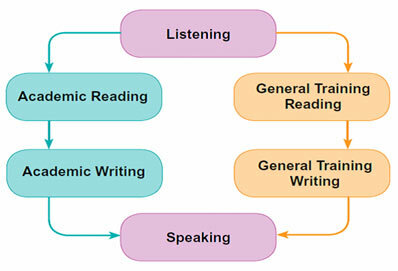 There are different Reading and Writing tests for the Academic and General Training modules. What are the components of the test? The IELTS tests all of the fundamental skills that you can put language to. The following is the distribution of test components. There are 40 questions A variety of question types is used, chosen from the following: multiple choice, matching, plan/map/diagram labeling, form completion, note completion, table completion, flow-chart completion, summary completion, sentence completion, short-answer questions. IELTS is internationally focused in its content. For example, a range of native-speaker accents (North American, Australian, New Zealand, and British) is used in the Listening test, and all standard varieties of English are accepted in candidates’ responses in all parts of the test. Questions: There are 40 questions. A variety of question types is used, chosen from the following: multiple choice, identifying information (True/False/Not Given), identifying writer’s views/claims (Yes/No/Not Given), matching information, matching headings, matching features, matching sentence ending, sentence completion, summary completion, flow chart completion and short answer questions. In Task 2, candidates are asked to write an essay in response to a point of view, argument or problem. The issues raised are of general interest to, suitable for and easily understood by candidates entering undergraduate or postgraduate studies or seeking professional registration. The Speaking test is a 3-part face-to-face oral interview with an examiner. © Copyright 2012 iCube Overseas Educon Pvt. Ltd.